Last week I wanted to update a VM running on Windows Server 2003 to SP2. Before that, for security purposes, I wanted to create a snapshot. But - strangely - the snapshot icon was disabled, I had no chance to create or manage a snapshot on this VM while it worked fine on other VM's. I tried to look for different settings between vmbroken and vmworks and found under Advanced the option "Paravirtualization disabled". I didn't have this entry in the settings of vmbroken so I guessed it must be something broken with the configuration file (vmx) of vmbroken. You see in the first three lines that the config.version and the virtualHW.version numbers are different. In this case I had to upgrade my virtual hardware of vmbroken. 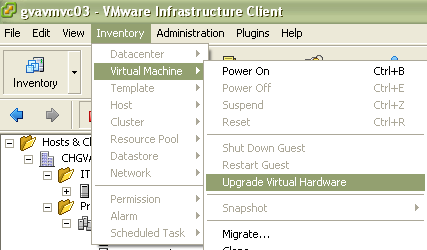 To do that, I have shut down vmbroken and in the VI Client I could now click on "Inventory/Virtual Machine/Upgrade Virtual Hardware" (be sure to have vmbroken selected in your list). See screenshot below.